Why Sessions and Rosenstein are being so cagey. The attorney general and his deputy aren’t dodging questions to protect Trump. They’re protecting themselves. 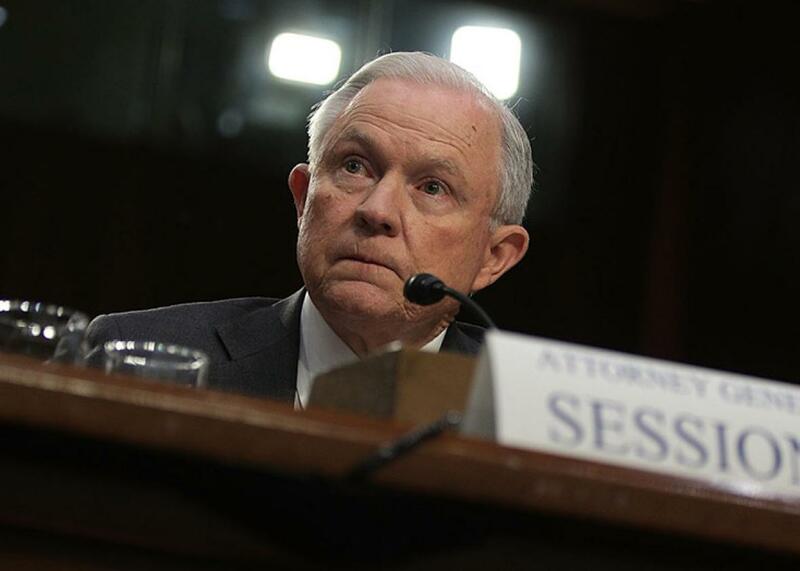 Attorney General Jeff Sessions testifies before the Senate Intelligence Committee on Capitol Hill on Tuesday. Did President Trump fire FBI Director James Comey to get rid of the Russian “cloud” over his administration? Lots of evidence suggests he did. Comey documented meetings and phone calls in which Trump pressed him to “lift the cloud” and “let go” of the investigation into Trump’s departed national security adviser, Michael Flynn, who was caught up in the scandal. Leading up to the firing, all of Trump’s public complaints about the FBI focused on Russia. And in an NBC interview two days after the firing, Trump said that while making the decision, he had thought about “this Russia thing” and what a “made-up story” it was. Now, as special counsel Robert Mueller escalates his inquiry into possible obstruction of justice, there’s an extra reason to suspect that Trump is guilty: The two lawyers with whom the president collaborated in the firing, Attorney General Jeff Sessions and Deputy Attorney General Rod Rosenstein, aren’t vouching for Trump’s innocence. They’re giving answers and nonanswers that seem carefully crafted to allow for the possibility that they were used. Trump’s original story, distilled in his May 9 termination letter, was that he fired Comey based on written recommendations received that day from Rosenstein and Sessions. That wasn’t true, and Rosenstein’s anger at being portrayed as the prime mover quickly forced the White House to backpedal. In his NBC interview, Trump admitted that he had already made up his mind by May 8, a day before the memos were written. Since then, Rosenstein and Sessions have gone further. Testifying on Tuesday before the Senate Intelligence Committee, Sessions said Trump had directly solicited the memos. Rosenstein, in a statement to Congress on May 18, denied that his memo was “a survey of FBI morale or performance” or “a statement of reasons to justify a for-cause termination,” as Trump and the White House had implied. Both men articulated arguments against Comey that were completely different from, and essentially contrary to, Trump’s public beefs with the director. They also noted that their arguments against Comey were long-standing, which leaves Trump to explain why he suddenly adopted them. Sessions, testifying the next day, was equally cautious. Sen. Dianne Feinstein asked him: “Did you discuss Director Comey’s handling of the investigations with the president or anyone else?” Later, Sen. Angus King asked him: “Did the question of the Russia investigation in the firing of James Comey come up?” Sessions ducked both questions, claiming that his conversations with Trump were confidential. He also refused to discuss Trump’s thinking. When Feinstein inquired about Trump’s confession to NBC—that the president had thought about Russia while deciding to fire Comey—Sessions demurred: “I’m not sure what was in his mind explicitly when we talked to him.” Many observers took these dodges to mean that Sessions was protecting the president. It’s much more likely that he was protecting himself. Like Rosenstein, Sessions distinguished between what he had written and how Trump had used it. When Sen. Jack Reed asked whether Sessions had any “inkling that there was anything to do with Russia,” Sessions retreated to the text of the memos. “All I can say,” Sessions replied, is “that our recommendation was put in writing. … How he [Trump] made his decision was his process.” Feinstein pressed Sessions about the May 8–9 sequence: “The decision had been made. What was the need for you to write a recommendation?” Sessions didn’t even try to answer her. “Well,” he allowed, “we were asked our opinion. And when we expressed it … I felt comfortable, and I guess the deputy attorney general did too, in providing that information in writing.” He described the memos as something he “did not mind” writing, as though a client had asked him to do something that was, at best, legally defensible. Democrats confronted Sessions with the flimsiness of Trump’s stated rationale for the firing. Sessions offered no resistance. Feinstein asked him about the White House’s account: “Do you really believe that this had to do with Director Comey’s performance with the men and women of the FBI?” Sessions referred her to Rosenstein’s memo, which said nothing about management or morale. Sen. Ron Wyden reminded Sessions that on May 8, just before firing Comey, Trump had tweeted: “The Russia-Trump collusion story is a total hoax, when will this taxpayer funded charade end?” Rather than defend Trump, Sessions defended himself. “The memorandum that Deputy Rosenstein wrote and my letter that accompanied it represented my views of the situation,” he said. Republicans tried to use Sessions as a witness for Trump’s innocence. Sen. John Cornyn suggested to him that “the Russian investigation did not factor into your recommendation to fire Director Comey,” since Sessions had recused himself on March 2. Sessions affirmed that statement. But he was denying that Russia drove his recommendation, not that Russia drove Trump’s decision. If Mueller concludes that Trump fired Comey over the Russia investigation, nothing Sessions or Rosenstein said in their hearings will turn out to be false. Sessions denied any collusion with Russia, and Rosenstein said he’s leaving such questions to Mueller. But on the question of whether Trump fired Comey to obstruct justice, and whether the president orchestrated a cover story to conceal that obstruction, the two men Trump enlisted are taking care not to vouch for his innocence. Maybe that’s because they can’t. Maybe they know they were used, and they don’t want to get caught in a web of lies.